New 25 Gallon Mounted Sprayer for Click-n-Go! 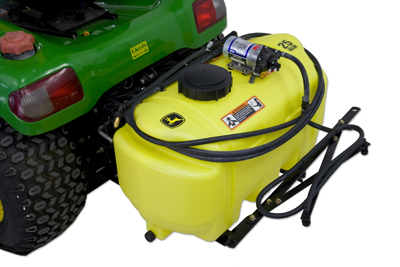 The 25 gallon Tractor Mounted sprayer is compatible with all tractors previously equipped with Click-n-Go brackets. Convenient. mounting, ease in maneuverability and overall versatility make this a perfect choice for your John Deere Garden Tractor. It provides an excellent way to apply spray material including liquid fertilizer, weed killer, tree spray and de-icer. It comes complete with a 60" folding boom that sprays a 90" spray swath. It is equipped with a 19-foot hose and a spray wand for spot spraying lawns, shrubs, etc. The fully adjustable brass spray wand tip achieves streams up to 30 feet. It has a custom mounting hardware that utilizes the Click-n-Go brackets for a NO TOOLS mount after initial assembly. 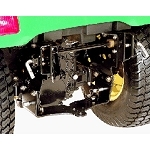 You are required to purchase the brackets seperately if your tractor is not already equipped with this option. Click-n-Go brackets are available for purchase by clicking here. Compatible with 425, 445, 455, X465, X475, X485, X495, X575, X585, X595, & ALL X700 Series tractors when machine is equipped with Click-n-Go brackets. 100 psi Shurflo diaphragm-type pump is designed for high hour commercial applications. It can be run dry without damage. The brass tipped spray wand is included as standard equipment. 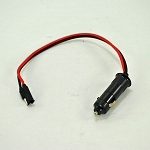 It is constructed of non-corrosive polypropylene material with Viton components for multi-use applications. Check valves in boom tips prevent siphoning and dripping, which can cause lawn spotting. Control valve directs spray to either the boom or spray wand. Convenient electrical hookup includes all necessary wiring. Rugged translucent yellow tank with molded fill level indicators (in gallons).